What came first, the “shell” or the “fish”? We always talk about seafood allergies, but what is seafood? Seafood is the term used to define any edible marine species, which include both fish and shellfish (crustaceans and molluscs belong to the shellfish category). However, there is a huge evolutionary difference between these groups. Fish are vertebrate species, meaning that they have a spine similar to humans (and to other more closely related animals), while shellfish are invertebrates, that do not have a spine. Naturally, the edible proteins that cause the allergies are very different in shape, size and function among these groups. Having a food allergy to cod fish does not necessarily mean that eating lobsters might cause allergic reactions as well. A peanut is a peanut, but fish and shellfish consist of over 1000 different species! Eight food groups (peanut, tree nuts, egg, wheat, milk, soy, fish and shellfish) are responsible for more than 90% of all allergic reactions. Fish and shellfish are a HUGE group. Fish include bony fish and cartilaginous fish; crustaceans include shrimps, crabs and lobsters; and molluscs include oysters, octopus and snails. In addition, each of these sub-groups consists of hundreds of species. All those species have allergens, which may or may not be similar to each other. This is important for development of the medical tests that can precisely tell allergic patients which species to avoid. Medical researchers and clinicians across the world are in a constant effort to identify and characterize the allergens that all these species contain. Fish and shellfish are found in different habitats; in freshwater or in seawater. Some of them are caught in the wild, while others are farmed in aquaculture. Seafood is processed in a way to ensure that it gets to the consumer as fresh as possible. However, there are several reasons to get an upset tummy even without having allergies: toxins found in some species can be a health threat and sometimes even be fatal! Paralytic Shellfish Toxins (PSP) and Diarrhetic Shellfish Toxins (DSP) are found mostly in molluscs that are filter feeders. Bacteria in seafood that has not been properly refrigerated may start producing histamine, which may give allergy-like symptoms upon consumption. Some seafood can contain toxins that cause reactions that are not allergic reactions. Fish can have worms too! There are parasitic worms called anisakis that are found in several fish species. In addition to the risk of a parasitic infection (humans are accidental hosts), which will not happen if the fish is well cooked, there is also a risk of having an allergic reaction to these worms. The worms’ closest edible relatives, the invertebrate prawns, crabs and lobsters share very similar allergens. An allergic reaction to fish can be due to fish allergy or might be due to reactions to these worms instead. A shrimp a day, won’t keep the doctor away! Allergies to fish and shellfish can start at any age, are hardly ever outgrown and can lead to severe reactions. 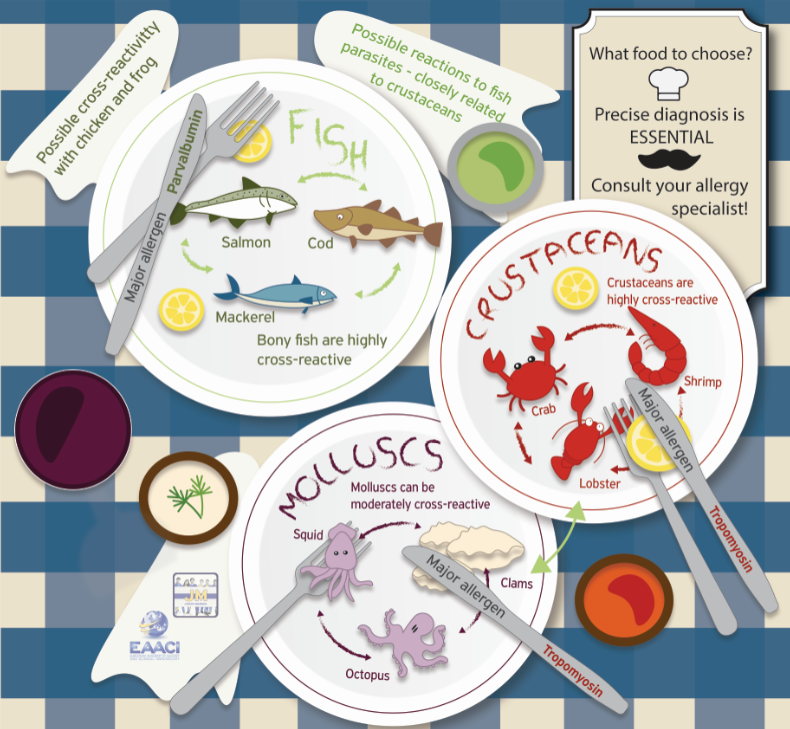 It is very important to consult a doctor or an allergy specialist to get expert advice on how to manage seafood allergies as it might not be necessary to avoid all seafood. Author: Sandip Kamath (Australian Institute of Tropical Health and Medicine, James Cook University, Townsville, Australia). 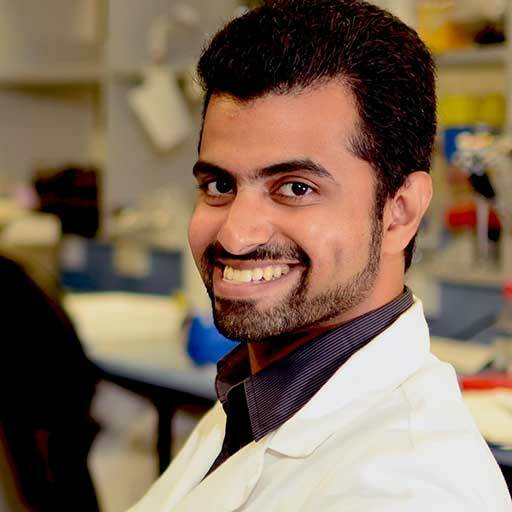 Sandip is a postdoctoral research fellow in the Molecular Allergy Research Laboratory. He is interested in the development and pre-clinical evaluation of novel protein- and peptide-based immunotherapeutic candidates for treating shellfish allergy. Sandip completed his PhD at James Cook University, Australia looking at the identification and characterisation of novel allergenic proteins in commonly consumed shellfish species with the aim of improving in vitro diagnostic tests for seafood allergy.